Step inside any prewar apartment on landmarked West End Avenue or stroll past the low-rise buildings on Amsterdam Avenue and you’ll find historic charm and a quaint feel — but you won’t see a lot of balconies or terraces jutting out. 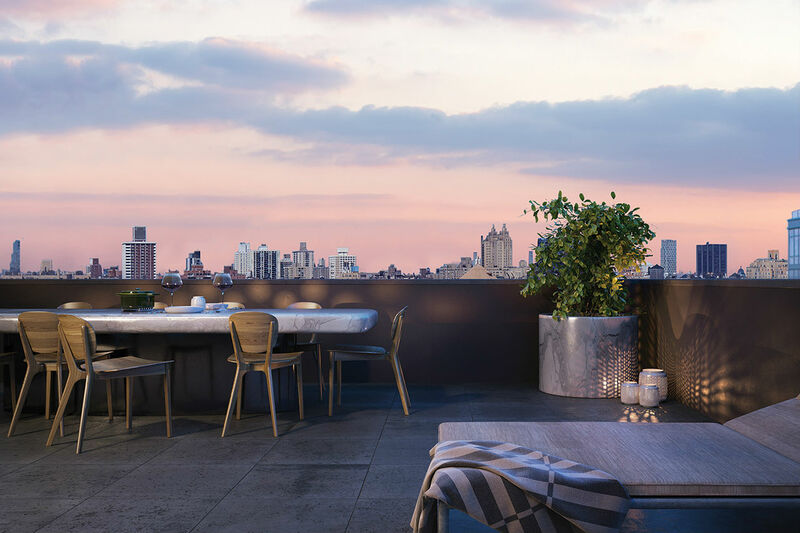 The age of many of the neighborhood’s buildings, situated in two historic districts, is a major factor contributing to the lack of outdoor space, said Paul Zweben, a local resident and a residential real estate broker with Douglas Elliman. “Most of the prewar buildings, they don’t have patios or an outdoor space. [For that], you’re predominantly looking at post-war buildings,” he said. And those are in hot demand, Zweben noted. “It takes you out of the hustle and bustle of New York City; it’s like a sanctuary,” Zweben said of the quest for outdoor space, adding that he encounters a lot of apartment shoppers who are willing to forfeit indoor space in order to get a terrace or balcony. Not including brownstones, only about 25 to 30 percent of the Upper West Side’s buildings have terraces or roof deck access, Zweben estimated. This still-unfinished 18-story condo building is selling half-floor and full-floor apartments, with floors 14 through 17 and the penthouse featuring private outdoor terraces.